Spring time salutations to all my friends in the music video world! It’s Andy Gesner and the staff at HIP Video Promo with another eye-opening video for your (and your viewers) enjoyment. As spring ’06 turns into summer, we can’t remember a time when our fellow citizens seemed angrier at the Federal government, or were more suspicious about official stories. Polls suggest that a majority of Americans now believe that the President and his men have misled the American public. Some artists have, understandably, turned away from politics altogether, disgusted with the entire process. But Ministry’s Alain Jorgensen isn’t the sort of writer who backs away from controversy – or from his feelings of rage and betrayal. Since 1992 Ministry has been Jorgensen’s vehicle for some of the fiercest critiques of the status quo heard anywhere in popular music. Grammy® winning Ministry have made a career out of confrontational sound and content. Arguably the originators of industrial metal, Ministry showed that groove music could be just as ferocious as metal. Since the Nineties, Ministry’s songs – and lyrical content – have only gotten heavier. The album peaks with “Lies, Lies, Lies”, a remarkably candid statement of disbelief in the official line on the Iraq War and the catastrophic events that led up to it. 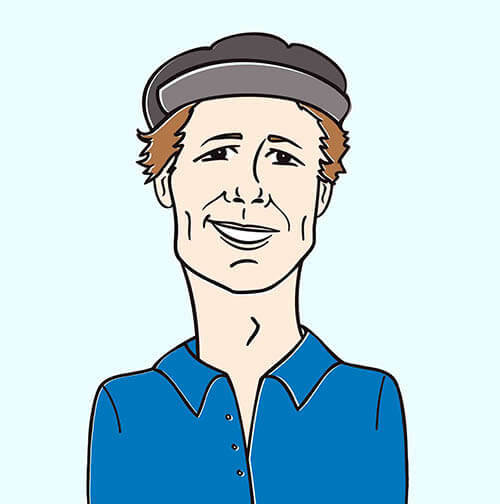 The song opens with sound clips borrowed from Dylan Avery’s incendiary documentary Loose Change – a powerful touchstone for those who believe the Bush Administration has covered up crucial facts about the 9/11 attacks. Over some of the heaviest beats in Ministry history (and that’s saying something) Jorgensen spits lyrics about government deceit, and punctuates a grinding guitar riff with a guttural cry of “lies!” that sounds as if it’s coming from the burning throat of an infernal judge. His conviction and his outrage are equally scalding. Here at HIP, we’ve certainly seen our share of anti-administration videos over the past six years. But we don’t think we’ve ever gotten one with more visceral power than director Zach Passero’s hypnotically engrossing clip for “Lies, Lies, Lies”. What’s so remarkable about it is that it isn’t really over-the-top at all – instead, it communicates its message of resistance through gestures of fear and bewilderment. Passero’s stationary camera scans the interior of a quintessential, television-dominated suburban home. As the people inside sit entranced by the motion pictures, an Arab bogeyman stalks the outdoors, just beyond a living room window. The family members respond as they might have been taught in a Cold War video, ducking and covering under the kitchen table. But there’s nothing parodic about this clip, and it’s shot with a curious coldness and a strangely antiseptic feel that leaves no doubt about the director’s feelings. All of the everyday objects inside the house seem to take on a too-still quality – they radiate terror and claustrophobia. Possessed, the eldest boy stares at the camera and fingers at a plastic raygun. In the next shot, he sits in the barber’s chair, shorn of his locks and wearing fatigues. Still in a trance, he leaps up from the chair, and follows a procession of marching skeletons – led by George W. Bush. We are so excited to be on board with the terrific team at Megaforce Records and Thirteenth Planet Records to bring you this controversial, jaw dropping clip! 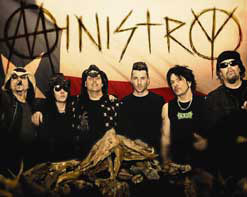 Ministry is currently headlining the MasterBaTour 2006. If you would like to set up a video interview with Ministry or get a video ID when this tour comes through your area, please let us know, and it would be our greatest pleasure to make it happen! We also have plenty of copies of Rio Grande Blood for all of your on-air giveaway needs! If you need more info, call Andy Gesner at 732-613-1779 or e-mail us at HIPVideo@aol.com.